After two exciting games, there was a rest day on Monday. Well, you can play a game yourself for a change, like the journos do in Sochi. There is nothing else to do in this ghost town. @chessvibes:“Norwegian journalists in Sochi playing chess over the board or with @PlayMagnus. Yep, #chessfever”. But now …. let us have a look at game 3. The tweets will do the talking….in 5 acts + encore. What do you expect, @garylanchess? “Looking forward to the game later and I expect 1. e4 this time and predict an exciting draw”. @yelenadembo: “Time to check the old Steinitz games”. @nigelshortchess: “I guess you all want some witty explanations about what is going on. I have no idea. Heavy theory, that’s all”. @anishgiri: “Same strategy from Magnus as in Chennai, a surprise in the first game and the ultra solid opening to follow…”. @yelenadembo: “By the fast replies of both sides, it is clear that they are nowhere near the end of their preparation”. 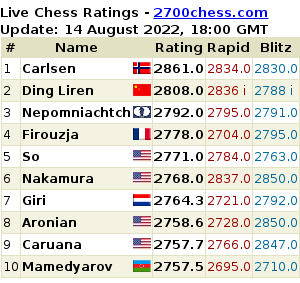 @fabianocaruana: “Looks like Magnus forgot or mixed up his prep,because this was all widely known a year ago. Anand may make an early comeback”. @Unudurti: “Magnus forgot that old Indian adage, when a tiger grows old, he turns into a man-eater”. @AnishGiri: “Vishy wins the third game of the match in Sochi. This is now a fact of Russian history too!” @humanlyAsshole: “I have never been as happy in recent time as i have been now. The Vishwanath Redemption”. @lladini: “I would love to see Vishy right now, when the door closes after him on the lift and he is finally alone”. @reachvsara: “That sheer joy only an Indian can feel, how this brilliant & ambitious man has brought happiness with his feats”. @aravindganesh: “Carlsen- Anand is like that of Arjuna-Karna battle. Now don’t ask me who is Arjuna & who is Karna…. @FSTIMJP: “To be fair, MC’s play over the board today would probably rank as among top five-ten worst in modern history of WC matches”.